Members of Cantabile will be amongst the Chorus of this first for Hereford and the Courtyard. This will be the first time that Chetham’s School of Music have come to Hereford. The concert, together with the two days of workshops with local schools leading up to it, is a collaboration with The Courtyard and Herefordshire Music Education Hub. The programme will include the chamber arrangement, by Edward Watson, of William Walton’s Henry V – A Shakepeare Scenario. It will also include a world premiere of a new work by a Chetham’s student which was inspired by the text of Henry V. The solo and duo performances will be given by outstanding Chetham’s students. Local generosity from Claridge Nursing Homes and The Friends of Herefordshire Museum and Arts have provided the funding. This entry was posted in Cantabile Girls, Events, The Courtyard and tagged Cantabile girls, Chetham's School of Music, Henry V - A Shakespeare Scenario, Herefordshire talent, The Courtyard on February 11, 2014 by cantabilegirlschoir. Nepal Earthquake Disaster fundraiser a sell out! 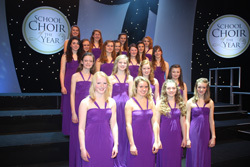 Small but Mighty – Hereford Cantabile are Winners of 2015 Senior School Choir Songs of Praise!